Making human right work for people in extreme poverty. As we celebrate Christmas, we are reminded that the Holy Family itself found safety in Egypt after fleeing the threat of Herold the Great. Today, their experiences are shared by over 68 million people who have been displaced worldwide, often seeking safety from violence and poverty. 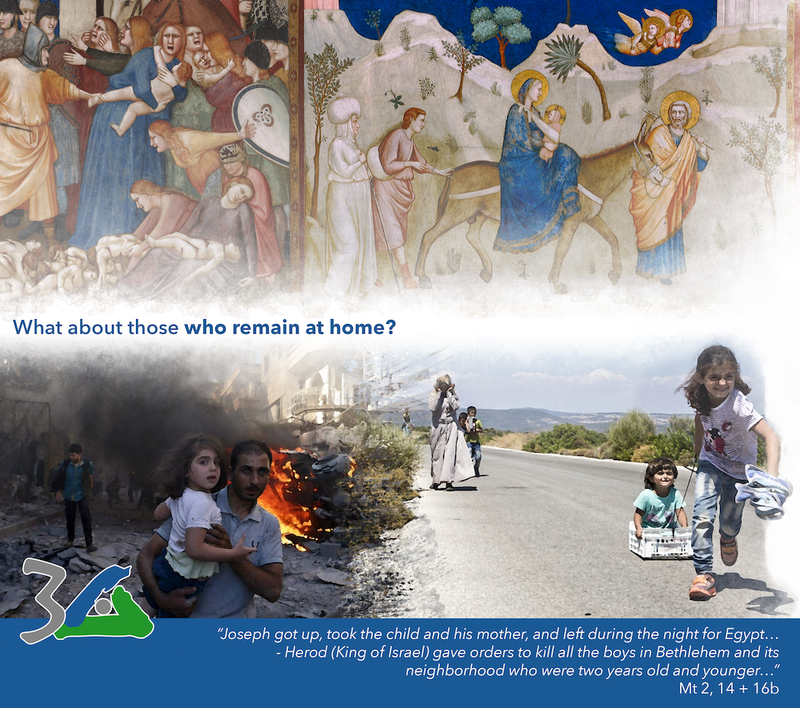 While the Holy Family found refuge, those that remained suffered greatly. Today, migrants and refugees take great risks as they traverse borders and seas. They do so to escape a fate much worse. Many of their friends and families are unable, or unwilling, to leave their homes. Celebrating the birth of Jesus Christ, let us not only welcome our migrant and refugee brothers and sisters, but also work toward making the world a safer place for all. 70 years ago, following the horrors of the second world war, members of the newly founded United Nations adopted the Universal Declaration of Human Rights. Since then, its 30 articles have laid the foundation for international treaties, human rights instruments, and other laws. While being a unique document, the Declaration enshrined values that were already core beliefs for many. 800 years ago, in his Letter to the Rulers of the People, St. Francis called on the powerful to respect human dignity, creation, and be unwavering in their commitment to peace. 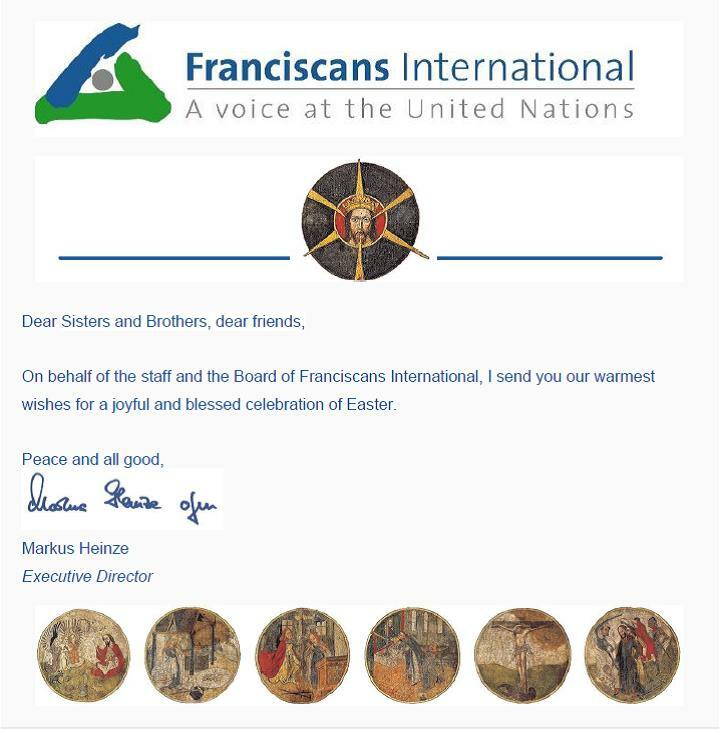 Following this long Franciscan tradition, Franciscans International advocates on behalf of victims of human rights abuses, to ensure that their voices are heard by today’s leaders at the United Nations. 2019 will mark Franciscans International’s 30th anniversary, and throughout the year we will be organizing a number of events to celebrate our achievements and reflect on the many challenges we still face. We invite you to actively take part in this campaign. Keeping us in your prayers: Dedicate a prayer to the victims of human rights violations that are supported by Franciscans International. Staying in touch: We are grateful that you have subscribed to our newsletter. If you’re interested in learning more about our work, consider following us on Facebook and Twitter. 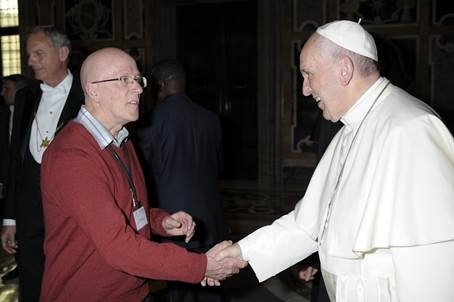 Spreading the word: Tell a friend about the work of Franciscans International. ​Dear brothers and sisters, fraternal greetings of peace! As we celebrate the feast of St. Francis with joy, we greet you from our JPIC Office of the General Curia. We present the third issue of this year’s JPIC newsletter, «CONTACT». You are invited to read and share our «CONTACT» Newsletter, which allows us to be connected and to know the various initiatives around JPIC values within the Order’s entities. Download here the new Annual Report. Lenten Reflection 2018 - Seven Last Words, Seven Acts. It is necessary to ensure the Rights of the Child in Benin. FI's Africa Coordinator comments on Benin's third UPR. Franciscans International’s Advent 2017 Reflection focuses on the four women mentioned in the genealogy of Jesus in the Gospel of Matthew. These four women will serve as an inspiration to identify and reflect on contemporary human rights issues that disproportionately affect women today. Franciscans International vous propose une Réflexion pour le temps de l’Avent 2017, qui met en lumière les quatre femmes mentionnées dans la généalogie de Jésus de l’Évangile selon Saint Matthieu. Ces quatre femmes sont sources d’inspiration pour réfléchir aux enjeux liés aux droits humains qui affectent les femmes de façon disproportionnée aujourd’hui. This Newsletter, which you will get three times per year, gives you a better picture of our work. Below, you can find links to highlights of our work at the United Nations, multimedia content, and our most recent publications. Today we celebrate the Feast Day of Saint Francis of Assisi, a man whose vision of a just and peaceful society continues to inspire people all over the world. The prevalence of injustice and violence today reveals to us the urgency and continued relevance of Saint Francis’ vision. Now more than ever, it will be important to focus on placing human rights at the center of our mission as brothers and sisters of Saint Francis. Whether it is war and political violence in the Democratic Republic of the Congo, extrajudicial killings in the Philippines, forced migration in the Americas, or environmental degradation, the rights of our brothers and sisters are being violated and diminished all over the world. At Franciscans International, we work to ensure that human rights are placed at the heart of our work in international development, environment, and security policies. In doing so, we work to improve the lives and uphold the dignity of those who are most marginalized. We also commit to protecting people and the environment by fostering human rights integration in relevant national and international laws and policies. Finally, as Saint Francis calls on us to be instruments of peace, our focus on human rights ensures that these rights are protected and upheld in the context of conflicts, crises, and crime prevention. I pray that on this Feast Day, we may be inspired and emboldened once again in our mission to lovingly care for our world, and for one another. ​Greetings from the FI Office! We thank you for your involvement and interest in FI's work to influence key policy makers to promote human rights for marginsalised and disadvantaged groups. Here are some of FI's recent activities. For questions or more information, please contact communications[at]fiop.org. In September 2015, FI and ATD Fourth World released their Handbook “Making Human Rights Work For People Living in Extreme Poverty,” a practical tool that presents key elements for mobilising and empowering people and communities living in extreme poverty to advocate for policies that promote and advance their rights. Since the launch, FI has been promoting the Handbook and its rights-based approach both at the United Nations, and among its partners on the field, developing training material and workshops to ensure its implementation as widely as possible. The workshops stress hands-on action planning and the development of concrete advocacy strategies by the participants. One in Mukuru, one of Kenya’s largest informal settlements, where participants focused on the right to land and developed advocacy strategies to defend it. One in the Philippines, with the aim to strengthen and develop advocacy strategies for keeping mining companies accountable to their human rights obligations towards indigenous peoples. One in Argentina, where participants from different regions gave accounts of how extreme poverty played out in their situations, and examples of different actions they were taking to counter it. One in India, where participants drew up action plans in order to help the most affected to claim their right to food, to hold authorities accountable to implement the National Food Security Act, and to make their way out of hunger injustice. One in Benin, where participants looked at the right to education, and elaborated plans to ensure that the children they worked with had access to decent education. In all these workshops, FI has been seeing the UN's Guiding Principles being translated into concrete ways in which marginalised communities can advocate for their own rights. Franciscan Voice and Happy 25th Birthday! In 1989, FI was officially accredited as an NGO with the United Nations - FI's Advocacy work started. Franciscans International (FI) is reinstating their newsletter Franciscan Voice and we're delighted to let you know that the January 2014 edition is now available in five languages with articles from the FI website. You can subscribe to the Newsletter or read it on-line. Read news from Geneva, New York and around the world. Learn about their advocacy and publications. Read the Franciscans International article here. Following the advocacy efforts of many groups, including Franciscans International and the Sisters of Mercy, at the UN, the provincial government in Canada’s Newfoundland and Labrador is no longer considering applications for hydraulic fracturing (fracking) projects. This is a vital step towards the preservation of fragile marine environments and world heritage sites in the region. Read more on our Ethical Use of Resources page.